Victor looks so finished now that Andy had the possibility to help us with the Franck’s grooming and shading, to really push it to the next level (with Lukas’s new hair features, of course). 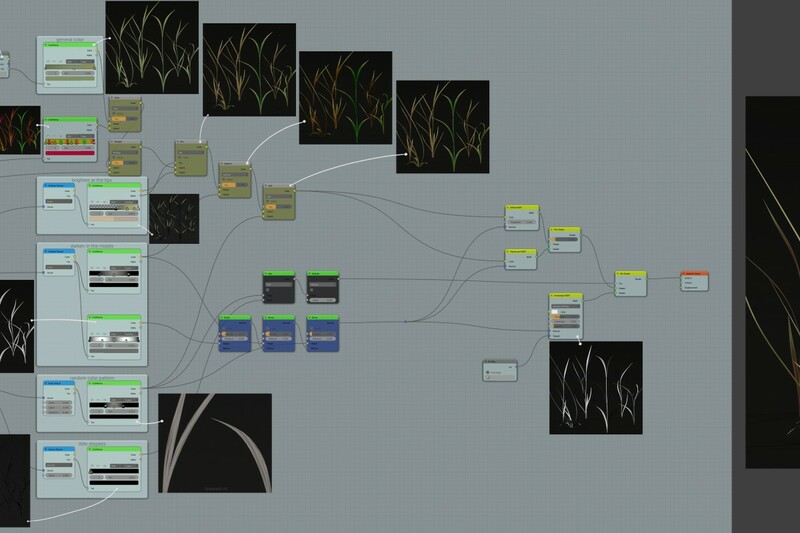 I started to work on environment again, and noticed Andy had made a very helpful procedural shader for some of the grass he had modeled. I think it will really inspire some of you procedural fellows out there, since there’s no image textures being used. So, here I gathered a not-so-little, and maybe a bit messy, chart on how the shader is constructed. * the camera ray can be use also to speed up thinks. that is totally the right thing to do. i just did it directly in the texture panel under Mapping. Looks good for a painting, but not very realistic. (maybe realism is not what you wanted, not sure) but real grass has fine light or dark strands running through them and almost you can see the cells in a leaf. Maybe add some voronoi noise.